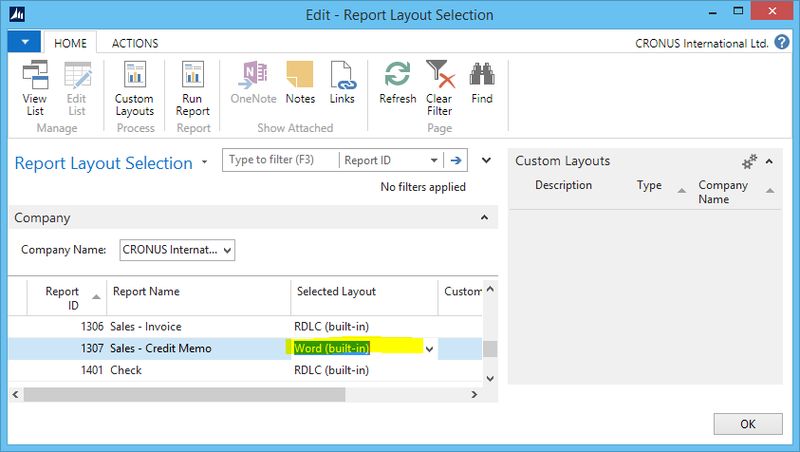 In new Microsoft Dynamics NAV 2015, we are introduced in new reporting feature – Word Layout. It means, that now we can use both of layouts, RDLC and Word. 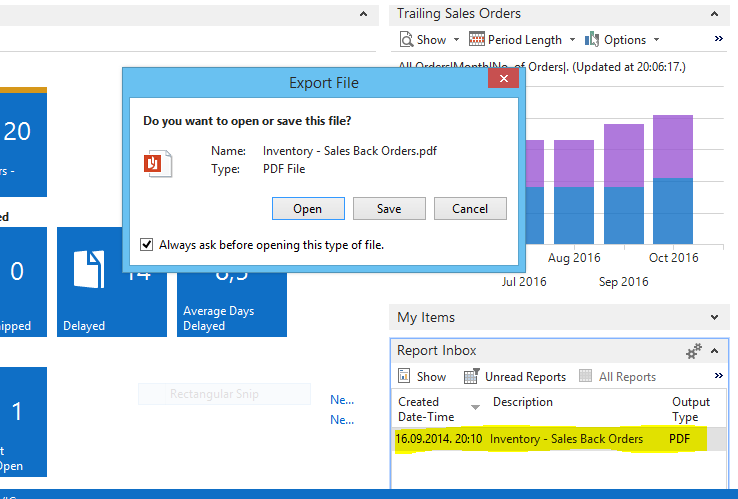 Microsoft Dynamics NAV 2015 includes 4 built-in report layouts that are used on reports by default. These are only “mini” sales reports: Sales – Quote (1304), Sales – Confirmation (1305), Sales – Invoice (1306) and Sales – Credit Memo (1307). By default, all of these reports are configured as ‘RDLC (built-in)’, but we can change it on Report Layout Selection. We can also customize these reports using ‘Custom Layouts’ command. But, what if we need more documents report in Word Layout, for example some of purchase documents. The biggest benefit of this feature is that you can give your customers to prepare own documents and don’t spend your time (and their money) on this job. Because of that, we need to be able to create Word Layout for new documents. 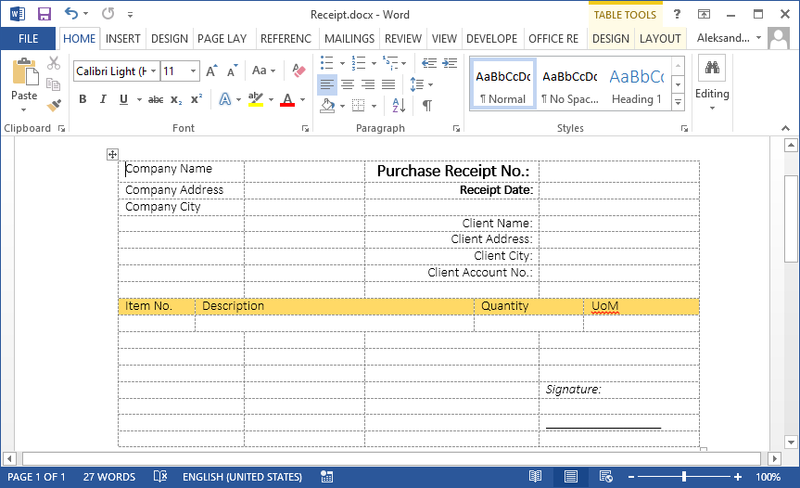 In my example, I will create Purchase Receipt document report. First of all, you need to create Word Document. You can see one small example on following picture. You need to put all required information (only as captions) on header, but on line, you need to put caption in one line and only one line for data, because, this line will be repeatable. OK, save it. Open Report Layout Selection and change Selected Layout to ‘Custom Layout’. Run “New” and choose ‘Insert Word Layout’. Fill some your description and Import Layout from your already created Word document. Then, press “Edit” and prepare layout. 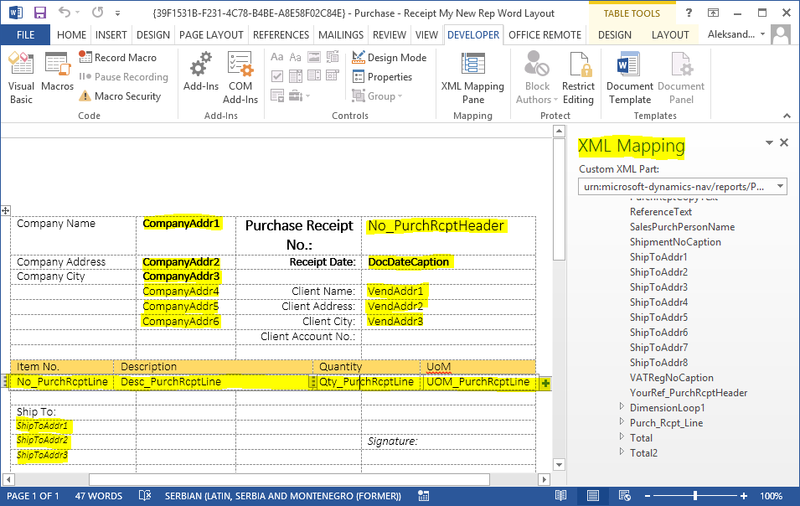 on Developer tab, find XML Mapping Pane and find your document in Custom XML Part. Now, you can find all fields from Dataset. Add these fields to place you want pressing right-click on some field in dataset and choose ‘Insert Content Control’ and ‘Plain Text’. For lines, first select complete row and on Line dataset field press ‘Insert Content Control’ and ‘Repeating’. After that, add fields you need. Save this document and close. Press Yes on window and choose this Custom Layout in Report Layout Selection. You can try this report on ‘Run Command’ and you can see this document as Word or PDF if you choose it. Cues as tiles already exist in the Microsoft Dynamics NAV client that display business data as FlowFields and integers. 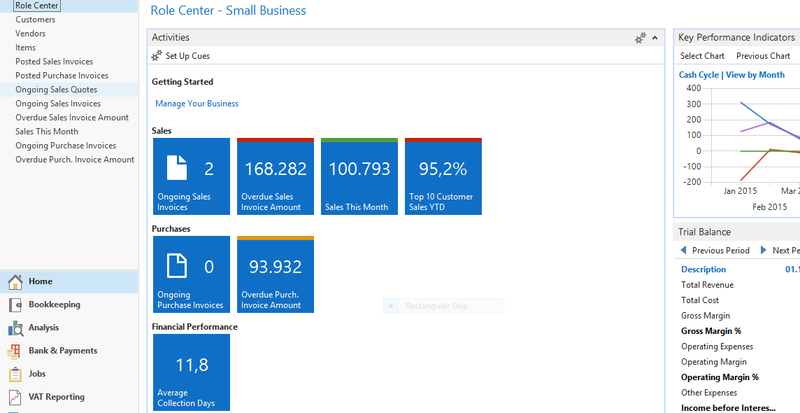 But with Microsoft Dynamics NAV 2015, they start as some kind of BI tools to also present key performance indicators (KPIs) on Role Centers and includes the following new features. 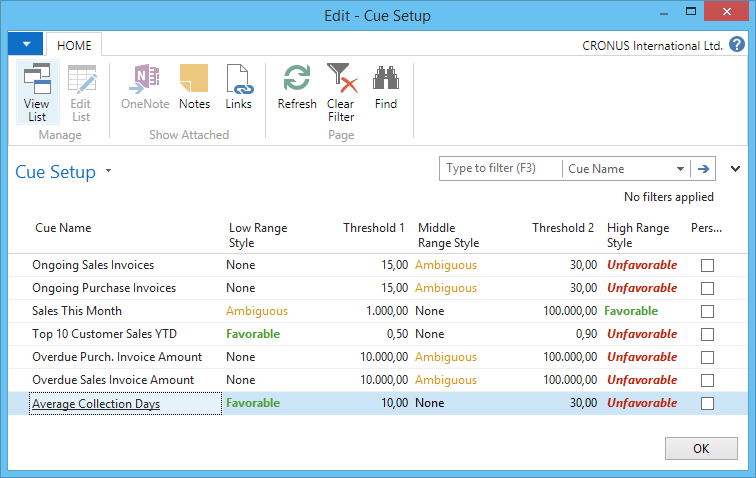 Now we have enhanced the functionality of Cues to give application developers, as well as end users, more control over the appearance of Cues. Each changing will be seen on all clients. Now, we have not only static tiles. With new feature, we can configure the Cue to display a bar along its upper border that changes color based on the data in the cue. It can be made by developing a cue or by end-user, using “Set Up Cues” on Role Center page. With this feature, Expressive Tiles provide us more quality in daily work. Developing cues, we can change the image that displays on the Cue or set up the Cue without an image on property. There are several images to choose from and for now, we cannot use customized images. In previous Microsoft Dynamics NAV versions, we could only set up Cues based on FlowFields and we could set up them to display on integer data types. Now, in Microsoft Dynamics NAV 2015, we can also use normal fields (instead only FlowFields) and we can also use a decimal data type. This provides us additional data aggregation possibilities instead of just COUNT, such as SUM, MAX, MIN, and AVG and of course, extends source of Cue data, such as using query objects. By using the AutoFormat and AutoFormatExpr properties, we can customize the format of the value in a Cue. For example, we can set the number of decimal places, or place a symbol such as currency sign or % before or after a value. In Microsoft Dynamics NAV 2015, a new property called UpdatePropagation is added to the page fields. 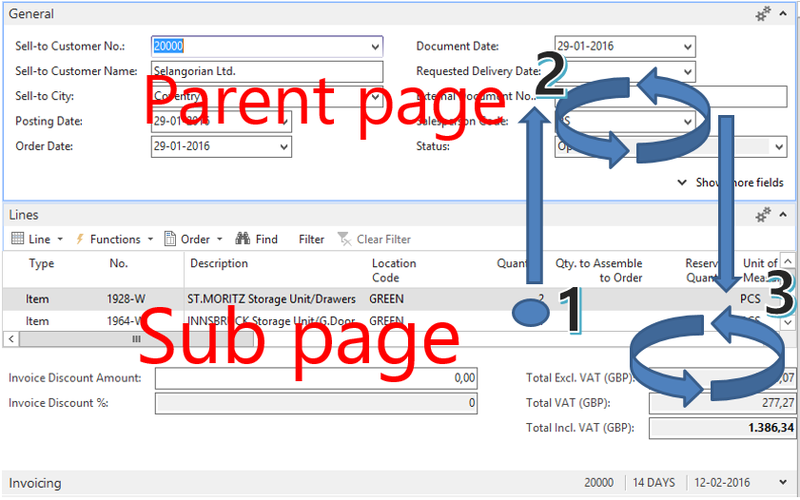 The introduction of this property makes it possible to update a parent page from a subpage automatically without using the page Refresh button. From child page request parent page to do update instead. The parent page first updates itself and then the children. It sets a value that specifies what happens when a main page with a subpage is updated. The UpdatePropagation property is available on part controls and has two options; Subpage and Both. If UpdatePropagation is set to Subpage, an update action will update the subpage only. If UpdatePropagation is set to Both, an update action will update both the main page and the subpage. This is useful if a value on the subpage changes, and you want a main page total to be refreshed automatically. Also, it works on all NAV Clients, doesn’t matter is this Windows, Web or Tablet client. We can use the UpdatePropagation property to update a main page total, when the amount on the subpage lines is updated. To do that, add a CurrPage.UPDATE(); call, for example, in the OnValidate trigger on the subpage to have the UpdatePropagation property take effect. Microsoft Dynamics NAV 2015 offers an easy way to run reports on Microsoft Dynamics NAV Server at a specified time and deliver the resultant report to a ‘Report Inbox’ on your Role Center. Run performance intensive reports on the Microsoft Dynamics NAV Server. Free up user interface threads while reports are running. The user can select when reports are run and the output format, such as .PDF or Word. We can do it when we want to print document. 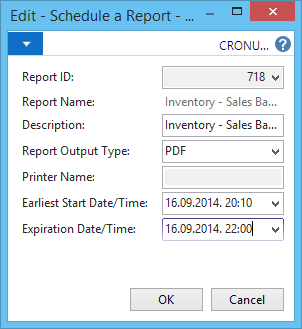 Only we need is to choose schedule option and fill dialog box with date and time when we want to get a report. If we want to use this feature, we first need to make some configuration. We have to set up a job queue that will run the scheduled reports and add the report inbox to the Role Center. When we configure all of these and when we run report scheduling, we can see that we have new report in report inbox on role center in scheduled date and time. After that, we can double-click on these new report entry and open the report. Fine new feature, especially when we have sized reports which requires a lot of times for creating. This functionality works from all clients, it doesn’t matter is this Windows, Web or Tablet Client.